This article shows how you can easily integrate the QODBC driver for QuickBooks into your workflow in Talend. 1. Open Talend ETL & create a new project by clicking on "Create..". 2. Enter Project Name & click "Finish". 3. To open project click "Open". 4. Add a new database connection to QuickBooks data: To add a new connection, expand the Metadata node, right-click the Db Connections node, and then click Create Connection. 5. In the resulting wizard, enter a name for the connection & click "Next". 6. On the next page, select Generic ODBC from the DB Type menu and enter DataSource name "QuickBooks Data" & click "Check" to test database connection. You will notice "Database connection successful" popup message on a successful database connection, Click "OK" to close popup message & "Finish" to finish configuration. 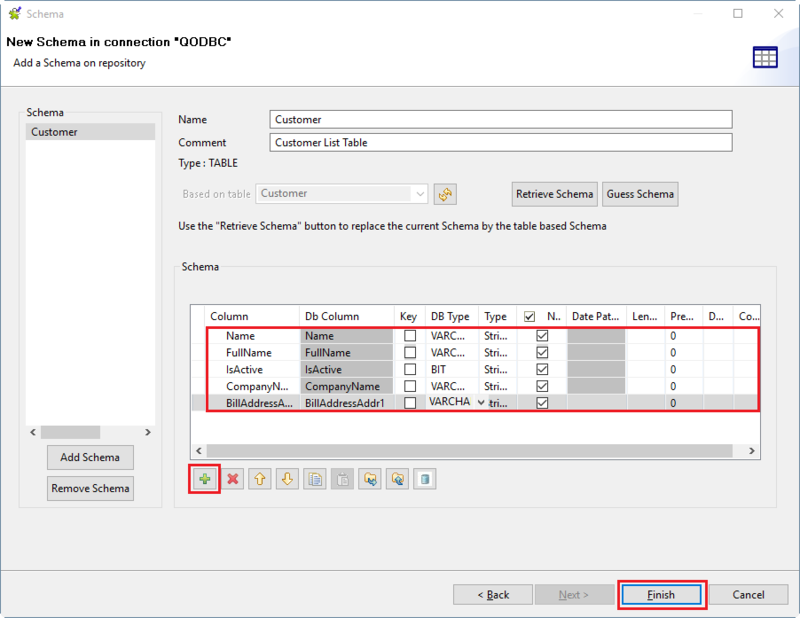 The database connection is added in the Talend ETL. Now that your repository database connection has been established, right-click your Database Connection and select Retrieve Schema from the pop-up menu. This will display the Schema dialog. Step 1 of this dialog allows you to set your Filter Conditions and your Selection Types. This step will only specify the filtering rules for the objects to import. Once these options have been completed, hit Next, to select the objects that you would like to import. Stage 2 allows you to choose objects. Name Filter allows you to hide objects from view. Select the objects that you would like to import, using the check boxes to the left of each node. When completed, hit Next. Note that you may need to allow Talend time to retrieve information from the database before this button becomes available. Stage 3 allows you to make some final amendments before you import. This is more useful when you are reviewing previously imported objects. For the purposes of this tutorial, we'll leave these options with their default values. Hit Finish to import the schema. If the schema is not loading automatically, then you can add schema manually by clicking the "+" option & add required columns. You can refer QODBC Data Layouts site for details about different report parameters. Navigate to the above link & Click on the region of the QuickBooks edition you are using. The table is added to the Talend ETL. You can now create a simple Job that will read data from your database. Create a new Job and drag one of the Table objects from the Repository to the Job Workspace. In the example shown here, the Customer table from the ODBC catalog will be used. When you drop the object onto the Workspace, you can choose the Talend component that should be used. Choose the default which is tDBInput (or the database input component for the database vendor you are using). Note. In this example, you're going to write the output of this table to the Talend Console so you may want to choose a table with a small number of rows. Add a tLogRow component to your Job and connect the two components using Row->Main. You should now be able to run your Job and see data displayed in the Talend Console. Your completed Job and results should look similar to the screenshot below.